Moving study space from the Library to URS will provide a quieter environment for study. It’s still close to the Library, so you won’t have to travel far for a quieter place to study. The Course Collection will move into URS to enable easy access to essential materials. Other resources will remain in the Library for borrowing as usual. The majority of Library staff will move into URS, but there will still be staff in the Library to help you. Information Desks will be set up in each building. Opening times for URS will be the same as the Library is now – URS will be open 24/6+ during term time (closed Saturday nights). The Library will open for additional 24/6+ hours during the Easter vacation from Monday 3 – Tuesday 11 April for revision purposes. From Tuesday 18 April the Library will open from 09:00– 22:00 seven days per week during term time. These arrangements will be in place until August 2018, at which facilities will move back into the Library. As part of the moving preparations over the Easter vacation, study space inside the Library building will gradually reduce somewhat until Tuesday 11 April. Please note, on this day, there will be no IT available in the Library building. The Library will be closed on the weekend of Saturday 1 – Sunday 2 April (closing at 17:00 on Friday 31 March) and over the University closure days at Easter (Wednesday 12 – Monday 17 April), with the Course Collection moving into URS during this time. The Library will open for additional 24/6+ hours during the Vacation from Monday 3 – Tuesday 11 April for revision purposes. From the beginning of the summer term, Tuesday 18 April, the Library building will open 09:00–22:00 seven days per week during term time. URS will be open 24/6+ during term time (closed Saturday nights). 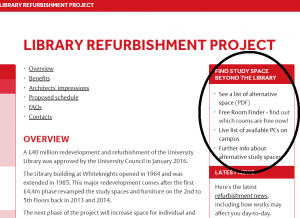 The Library refurbishment is a complex project – we’re doing everything we can to minimise disruption to you and your studies wherever possible. Besides URS, there are many other spaces across our campuses for quiet study, subject to teaching timetabling and departmental use. List of alternative space across our Whiteknights and London Road campuses. Live list of available PCS – helpful in choosing where to study. The Study@TOB2 – a new area created at Earley Gate as sister to RUSU’s The Study, it provides an additional 64 spaces for individual and group study, a printer, full Wi-Fi and plenty of plugs for laptops. Need a room quickly? The Free Room Finder lets you find rooms available for immediate use – simply choose an area of campus and let the finder do the rest. Several of the spaces marked as available will be used for teaching and other departmental activities at certain times, so please be sure to treat each space with respect. Please read our Classroom Rules before using alternative study spaces. Spaces within each building will be available on a first-come first-served basis; however, priority will be given to students wanting to use alternative study space within their subject-area building. If you have any queries, please email library@reading.ac.uk. If you have a disability and have any concerns about using either the Library or URS Building facilities, please contact Matthew Holtby, Library Disability Co-ordinator. Further information on the Library refurbishment project can be found at www.reading.ac.uk/library/refurb. This entry was posted in General news, Refurbishment. Bookmark the permalink.